American politics has been ugly of late. But political attacks in the U.S. cannot compare with those in modern China. This tumultuous process is captured by changing Chinese poster art. President Xi Jinping has been taking down powerful opponents, so-called “tigers.” However, he has not revived propaganda posters, once a pervasive political weapon.SHANGHAI, CHINA—Shanghai is China’s financial capital. A former Western concession, the city today shows little sign of the many bitter political battles fought over the last century. Tourists throng the Bund along the Huangpu River while global corporations fill the skyscrapers in Pudong, across the water. But politics in China today is a blood sport. President Xi Jinping has been taking down powerful opponents, so-called “tigers.” However, he has not revived propaganda posters, once a pervasive political weapon. As China opened up and reformed posters disappeared. Many were destroyed. What had become a unique art form almost disappeared. Now licensed by the government, the exhibit’s official name is the Shanghai Yang Pei Ming Propaganda Poster Art Museum. 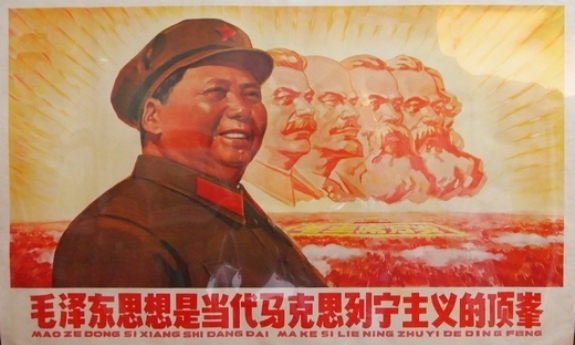 Yang accumulated 6000 different propaganda posters from 1940 to 1990 and a plethora of other tchotchke from Mao’s suffocating personality cult. The earlier posters look more cartoonish or stylized, reflecting an era of relative freedom. Soon the atrocious school of “socialist realism” took over, presenting the “reality” of the triumph of socialism—happy workers and farmers busily creating utopia on earth. Not every poster had his visage. One shows members of the People’s Liberation Army being greeted by happy Chinese. Others show model families, community celebrations, happy workers building the new China, and people enjoying an abundance of food. Some posters were more pointed politically. Entitled “Drive US Imperialism Invading Force out of China,” one shows a PLA soldier with a broom sweeping away the debris of a defeated foe. Many posters celebrated Beijing’s relationship with the Soviet Union. Many posters were weapons in domestic political battles. Confronting “bandits and spies” was a common theme. Reactionaries, landlords, and other enemies also were targeted. So was the U.S. One of my favorite shows a Chinese patriot preparing to stab a blood-stained, fire-breathing Douglas MacArthur, enjoining the Chinese people to “Defend our Motherland and our Hometown.” President Harry Truman might have agreed with these sentiments, given his firing of the general. One poster shows a worker defending against a reactionary mob, declaring: “Smash the Attack from the Rightists to Defend Socialist Construction.” Many posters urged greater production and lauded “bumper harvests” in the midst of devastating famine. During the early 1960s posters reinforced the Mao cult and increased attacks on the U.S. for its involvement in Vietnam. The heyday of posters was the Cultural Revolution, which began in 1966 and eventually wound down a decade later. During this period the Great Helmsmen used posters to take the personality cult to new heights while denouncing his enemies, named and unnamed alike. The pragmatic Deng Xiaoping came to power, and abolished what he called the “big character poster.” He wanted no more political crusades or ideological campaigns, no more social chaos and economic disruption. What’s best for China is a loss for the rest of us, at least us political junkies. At least Shanghai’s poster museum preserves this unique art form for the rest of us. American politics has been ugly of late. But still, politics in the U.S. cannot compare with that in modern China. This tumultuous process is captured by changing Chinese poster art. The Shanghai Propaganda Poster Art Center should be on the “to see” list of anyone visiting the city—or going online.